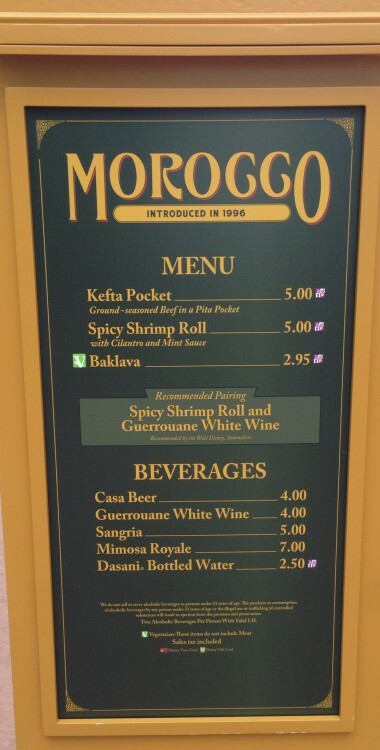 Food & Wine ’14 “Flash Report”: Morocco | It's "All in WDW"
Sadly, Morocco just receives a menu report from us this year. We’ve tried their Kefta Pocket in past years. It just wasn’t good enough to raise our interest again. And, when it comes to 2014’s Spicy Shrimp Roll? Well, all we could think about was “Food” & Garden’s Lamb Brewat Roll. That roll was really greasy. Sorry, Morocco. We passed, this year. Well, it’s your loss not having the Kefta Pocket.